For a paper big enough to match your creative ideas, get the Shoji Baika Japanese Paper Roll. Measuring 37 inches by 23 feet, this authentic Asian paper consists of kozo and sulphite fibers with a bleached color and un-absorbent properties. One sheet just isn’t enough? 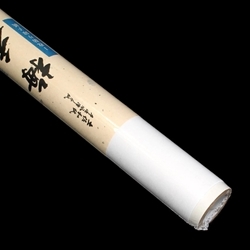 Make it a roll with the Japanese Shoji Baika Paper. This traditional Japanese paper is machine-made from 70% Thai Kozo and 30% Sulphite fibers, making it a strong and durable foundation for a variety of projects. The paper pulp is cooked with caustic soda, resulting in a bleached white color and non-absorbent (sized) texture. As for its size, big is an understatement. At 37 inches by 23.25 feet, this Japanese paper roll is huge! In other words, it is the perfect medium for limitless art, decor, and conservation projects.